Edith Nakalema (R) with President Museveni in Luweero. President Museveni's decision to send Maj Edith Nakalema, a personal assistant, for a military course in the UK could be the start of a major clean up at State House, highly placed sources told The Observer this week. "You were either with her, or against her," said one of the sources who is familiar with the inner workings of State House. She will also concurrently pursue a master's degree at King's College, London. Sources told us that it speaks volumes that Museveni made the final decision to let Nakalema go for the courses. She said: "Whether there are people celebrating, I don't care. For me, I am very grateful to the commander in chief [President Museveni] for elevating me to where I am. Who knew me before? Now everyone who matters, including journalists, know me." She said she was happy that the president found her useful, adding that if people don't talk about you; it means "you are useless." "I am Born Again. I have a loving God, a loving president, a loving husband and both my parents are still alive. I don't dwell on the negatives," Nakalema said. In 2010, when Amelia Kyambadde, arguably Museveni's most influential Principal Private Secretary (PPS), decided to quit her job to join politics, she left a huge devoid. In an interview with NBS TV in March, Kyambadde said the president had on several occasions tried to talk her out of the political decision. Having worked with Museveni since the late 1970s, Kyambadde was "a historical" in every sense of the word and accumulated a lot of power. "There was some cultural shock for Akello and Amajo. Many people around the president are from western Uganda and some looked at these two as outsiders," said one of our sources. Amajo particularly committed some blunders. Once, she forgot to schedule Museveni's visit to a foreign country and when the president found out late, he was furious.As the president became increasingly frustrated and in need of someone who would restore order and a form of predictability into his schedule, he started to look around. Nakalema had worked in the finance department of SFC and had been part of a team that instituted sound financial controls in the elite army unit. Matters were also helped by the fact that Museveni personally knew Nakalema's parents, Eiyasafu Sserwadda and Midrace Sserwadda of Kashaari, Mbarara district. Sserwadda is a prominent parish priest in Kashaari. Nakalema's job title was personal assistant to the president (which is not a lofty position) but in effect, her role was to take over and directly manage the public life of the president. She scheduled Museveni's appointments, scanned through his daily schedule; cancelled events that she thought were not important and vetted the people who wanted to meet the president. She, in effect, became Museveni's PPS without officially carrying the coveted title. 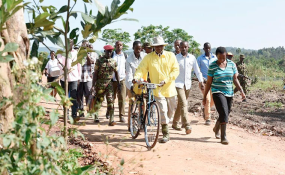 Museveni did not have qualms with this and constantly told those who wanted to see him to go through Nakalema. Within a short time, Nakalema had become so powerful and influential that even senior government officials worshipped at her feet and sought her approval. In military rank, Nalweyiso, then a brigadier, was way above Nakalema, a major. This, she thought, gave her impetus to try and put Nakalema in order. Yet what happened next is a story that is only spoken in hushed tones within the marbled corridors of State House. Nakalema found a way to turn tables on Nalweyiso by exploiting the fact that the brigadier was now working in State House "illegally." "I am going to inform the president," she reportedly said, according to an account of someone who witnessed the exchange. Nakalema accepted the apology and the two struck a friendship that continues till today. Yet with Nakalema's power came some missteps. For long, Nakalema's excesses had been reported to the president by some of the staff. Some were in plain sight, like when she stumped on a former employee at an airport in South Africa in the presence of Museveni. Somehow, the president appeared to do nothing. A former State House employee told The Observer that usually the president's reaction would be: "I will handle the matter." With time, the president realized that this infighting at State House had gotten out of hand and was affecting the institution's image. Sources said he started a search for a PPS who would restore order and sanity. A number of names were thrown around, including that of Robert Kabushenga, the chief executive officer of the Vision Group. The two had already clashed during the campaigns over influence and sheer ego. They are both aggressive individuals who hate to be dominated. Whatever his calculations, the president either wanted them to find a way of working together, or to clip Nakalema's wings. Kamukama's appointment put many State House employees, who knew her differences with Nakalema, in a fix. Many believed that they had to align themselves with either Kamukama or Nakalema. Sources said Kamukama tried to make her presence felt immediately. She took charge of the president's schedule and started making some changes. In an effort to have the president's ear, sources told us that the two have already clashed and reported each other several times to the president. A serving employee claimed that Kamukama had started purging people that she believes are close to Nakalema. Kamukama did not return our calls yesterday. Museveni's decision to send Nakalema abroad could mark the end of her career at State House. When she returns after a year, she will most likely be promoted to a higher rank and posted to a new office.